Beloved Scots You Tube star pensioner Grannie Annie has passed away - leaving hundreds of thousands of fans of her comedy devastated. The news was broken online by her grandson Tommy Ga-Ken Wan who lovingly called her the funniest woman in the west. 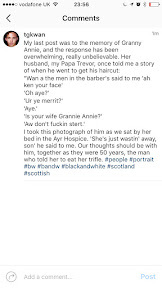 Grannie Annie, was often referred to as the Swearing Granny and passed away in Ayr Hospice leaving behind her husband of 50 years Trevor. She accumulated thousands of hits on You Tube and her Facebook video commanded an impressive amount of likes and shares after she first appeared online in 2011. Her videos were even subtitled for those who didn't live in Scotland and she became famous for her rants beyond her neighbourhood as a result. Grandson Tommy who posted her many videos online said: "She had a foul mouth and a heart of gold. To me she was Nana Ann, to get fans she was Grannie Annie. Rest in piece ya auld bugger. Hearing the news Dang Mcwhinnie from Coatbridge said: "That's heartbreaking. Wee Grannie Annie." Natalie Ellen Allan added: "RIP grannie Annie We all love you. You will be so sadly missed. You gave us comedy and never failed to make us laugh. Thoughts are with the family." 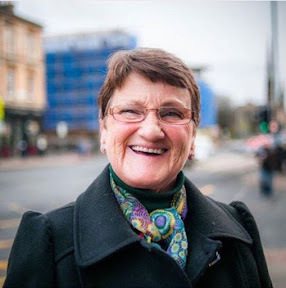 Jo Donaldson from Springburn was also upset and said: "Ah man, genuinely sad to hear about Grannie Annie passing away. One of my favourite YouTube videos of all time that I came across by accident years ago. RIP Grannie Annie." And Craig McClurkin even said: "Am gonna email ma lecturer saying am no coming in because of this."